470 kilometres long, the Lebanon Mountain Trail runs from Marjayoun, a sleepy town in formerly Israeli-occupied southern Lebanon that looks over a vertiginous escarpment into the Galilee, to Andqet, an even sleepier village in formerly Syrian-occupied northern Lebanon, now just a few kilometres from the war in Syria. I’m not sure when I had the bright idea of walking from one end of Lebanon to the other. I seem to recall it surfacing during an arak-fuelled conversation some time in 2006, shortly after the August War between Hezbollah and Israel when getting up into the mountains and far away from the dull ache of shattered dreams and lives seemed the best of all possible escapes. (…. )Just after 2am on January 8th, my mother passed away. 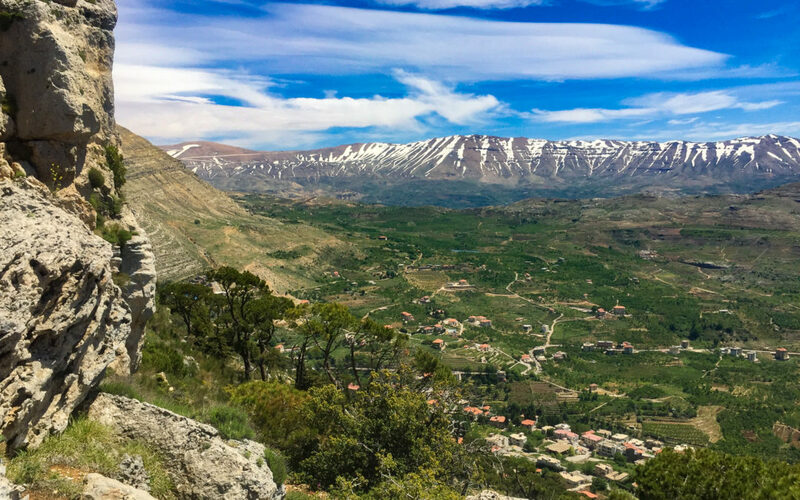 Once the necessary phone calls had been made (…), my first fully conscious act was to email the Lebanese Mountain Trail Association and sign up for the month-long walk through they organised each Spring along Lebanon’s first national hiking trail. (…. )The world became perfectly still. Beneath my feet, I could feel the thunder of the waterfall we’d just passed reverberate gently through the pipe. Above, the peaks were hidden in cloud, tendrils of which swirled down through the forest to wrap around us, turning our side of the valley into a chiaroscuro of mist and mountain, rather like a Chinese ink painting. Baskinta, though, was brightly illuminated, an island of sunlight in an otherwise grey day. From up here, it was a sprawl of red-tiled pyramid roofs darkened by the rain, punctuated by church spires and the occasional and generally rather unfortunate new construction. Some 470 kilometres long, the Lebanon Mountain Trail runs from Marjayoun, a now sleepy town in formerly Israeli-occupied southern Lebanon that looks down over a vertiginous escarpment into the Galilee, to Andqet, an even sleepier village in formerly Syrian-occupied northern Lebanon, which is now just a few kilometres from the war in Syria. After running from Marjayoun into the rocky, arid Anti-Lebanon and the foothills of Mount Hermon, on the other side of which lies Syria, it crosses the southern Beka’a Valley and then runs straight up and over lush Mount Lebanon to the forested Mediterranean side of that range to the town of Jezzine. From there, it winds its way north, oscillating between the 1200 to the 1500-metre mark, dipping as low as 600 metres and rising as high as 2200 metres until it ends in Andqet. The Trail is split into 26 segments, each conceived as a day’s walk, each starting and ending in a village. Most segments cover a distance of between 16 to 20 kilometres, with the single longest day being a 28-kilometre slog that rewards South-North walkers with the truly awe-inspiring end of day spectacle of Qamouaa, an almost Swiss idyll of a plateau, where the peaks of Mount Lebanon abruptly collapse into foothills that roll all the way to Syria before stopping. (….) Lebanon, as the Lebanese are fond of saying, is a very small country (…) but it is incredibly diverse. The landscape not only changes from day to day, in sections it changes from metre to metre. One day, near Jezzine, we passed through thick Mediterranean pine forest, into an Arabian sandstone gully, twisting walls painted orange and red and then out into an almost Alpine flower meadow. All in the space of less than 500 metres. Lebanon’s topography, best described as a narrow coastal plain, backed by two north-south mountain ranges that top out at 3080 metres, between which lies a high-altitude valley, make it is home to a dizzying array of microclimates, everything from the sub-tropical to the alpine. The trail is a perfect microcosm of Lebanon; the great, the ghastly and the utterly unexpected. It’s a world where you can walk through millennial oak trees and follow tracks through flower-filled grasslands, only to suddenly find yourself face-to-face with a brand new road, ugly housing development, ski resort or more sadly, Syrian refugee camp and then just as quickly lose yourself in almond orchards, leafy river valleys or ghostly Karstic uplands, where the exposed limestone has been sculpted by millennia of wind and rain into fantastical shapes; an eagle’s head or a crouching tiger here, a protective deity or a huddle of elephants there. And so,(…), the Lebanon Mountain Trail Association has arranged accommodation in local homes. Walkers get to stay with families and eat regional specialities, dishes made from produce grown by your hosts or their neighbours or else foraged from the mountains. Over the course of our first five days, for example, one of the dishes we ate every night was potato kibbeh, a vegetarian take on the more famous meat and bulgur wheat version, which resembles a stuffed, fried meatball. We had plain kibbeh, kibbeh stuffed with yoghurt and mint and kibbeh stuffed with an unctuous meat preserve called qawerma. Some were rolled into balls, some served as mash. One version even came without the bulgur wheat. They all tasted different and yet they were all potato kibbeh. A less stated goal is to introduce Lebanese of one region (and usually religion) to Lebanese of another, for although the civil war ended in 1990, continued instability and decades of mistrust mean that many Lebanese still do not know their own country, preferring to stick to areas where they feel comfortable. So the trail leads through villages that are Christian, Druze, Sunni and Shi’ite and makes a point of including sacred and historical sites that represent each sect. This year’s walkthrough was split into two groups. Our group, the smaller of the two and codenamed Team Wolf, was led by the redoubtable Joseph and the irrepressible Robin. Studies in contrast, the former was as taciturn as the latter was effervescent, both fountains of knowledge, Joseph a master of wildlife and local legend, Robin a trained archaeologist and historian. Together, they would lead us through forested valleys, across icy streams and up, up into the cloud-kissed highlands. We would poke around 2,500 year old Phoenician tombs, strewn casually across a hillside, walk along Roman roads, in places so perfect, they looked like they’d only just been laid, visit Crusader fortresses and spend nights in crumbling, ornate palaces. We’d visit the sanctuaries of saints and seers, the raging waterfall by which Adonis was killed by a wild boar and where in the great temple to his lover Aphrodite/Astarte, sacred orgies once took place, the Druze mountain top shrine where Job lived and suffered for nine years, the caves the first Christian hermits inhabited in Qadisha, the Sacred Valley, mosques that began life as Phoenician, then Greek, then Roman temples. We’d eat pastries made of grains not only grown by the woman who baked them for us but ground by her as well, drink wine made by monks, pick wild asparagus as we walked and gorge ourselves on squishy berries, crisp sour plums and tart young green almonds, eaten whole, their downy flesh wrapped around liquid centres that would eventually become the nut, which burst with a citrusy splash as we bit into them. But on April 2nd, those wonders were all still to come. The trail beckoned. Open and rolling, it crossed the plains and up into the foothills that broke like waves against the majestic flanks of Mount Hermon, passing through lush green valleys that purpled, then faded into violet as they rose up, up towards the sky, where a mantle of thick, white snow, sparkled brightly in the morning light. Walking Lebanon was originally published in DestinAsian magazine in January 2017. This article also appears in Warren Singh Bartlett’s blog On the Go. Warren Singh–Bartlett walked the LMT in April, 2016. An author and a journalist, he has lived in Lebanon since 1998 and is currently working on two books; a collection of Instagram posts about Lebanon, which will be published in July and a travelogue based on the LMT, which will weave the story of the walk together with Lebanon’s history, cultures and traditions, as well as stories about places, people and events taken from the last 19 years.